Happy birthday George and Fred. That’s the trouble with legends, I suppose. If nobody’s telling the stories, people forget them. So I said I’d do it. 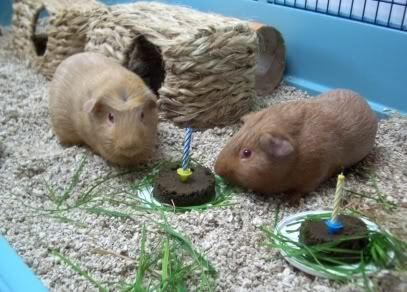 Fred and George were Mummy’s very first guinea pigs. They were born today, in 2007. That’s nine years ago, which is longer than nearly every guinea pig lives (although we have heard of some even older), and I think Mummy has accepted they’ve long gone over the Rainbow Bridge, and would have gone by now anyway. Of course, she’s experienced so many of their successors going over the bridge, that nobody here knows them, apart from the pictures opposite Oscar’s and Percy’s cages downstairs. The last person that knew them well was Victor, and he’s been gone two years now. Humphrey and Hector met them, but as far as I know, Hector didn’t pay them much attention. And he’s been gone a year, too. So I only know from what I’ve learned. Anyway, Fred and George taught Mummy all she knows about guinea pigs (although I think we’ve each added a little more, so she knows even more now). They were the perfect people for Mummy to start with, polite, gentlemanly, interested in lots of things, knew what was good to eat and what wasn’t… I noticed Percy left his pea shoots yesterday, and everyone knows that pea shoots are yummy, and Fred and George knew that too, which was why Mummy grows them for us. I don’t think Percy had ever met them before. Fred was a philosopher, and a great leader. He would sound the alert when any of the birds in the garden made alarm calls, so everyone stayed safe. He would explore things too, although he wasn’t keen on being on the kitchen floor. He checked out a few places in the garden he wasn’t supposed to go, like onto the vegetable patches. But mostly he’d stand and nibble the bits from the edge. George was an engineer, and was great at making things. He made all the grassy hutches into palaces, and invented all sorts of things in his head. He used the watch the flying machine that went over the garden in the summer, and started inventing his own version. He was also the Forum Mechanic for the Rodents With Attitude forum, and gave out lots of homely advice to people from a guinea pig perspective. He was shy and retiring, but very amiable and patient. He also had lots of trouble with his teeth, and had to go to see all sorts of people to get them sorted out. Which is how we met Auntie Shirley and Uncle Barry. Thanks to George’s work on the forum, he learned about computers, and set up this blog, George’s Guinea Pig World, and also the Facebook page. It’s his legacy, I suppose. I know Mummy considered whether the name should change after he died, but everyone decided to keep it the same, which is why we introduce ourselves on Facebook, when I say “Kevin here’ so people don’t get confused. I think if Mummy hadn’t got Fred and George when they were six weeks old, she might never have got the rest of us. And she would never have started writing the books, either. So really, everything we are now, we owe to Fred and George. There’s a thought. Happy birthday, Fred and George. Fred and George were beautiful. I’m glad your mom shared their story today. It’s always good to tell the stories of our forebears so they will live forever in our hearts. The two of them are so dear. I’m glad there are still memories of them around.